Ryan Schultz began to contemplate the application of crowd sourcing to architectural design after reading “Wisdom of Crowds,” by James Surowiecki and “Wikinomics” by Don Tapscott and Anthony Williams. And when Schultz discovered Second Life (SL), a 3-D virtual world accessed through the Internet, he realized that the actual implementation of this open source approach to architecture could become a real possibility. About this same time, Schultz came across Jon Brouchoud, an architect from Wisconsin, who was using Second Life to prototype and exhibit his home designs for clients. The two began corresponding through e-mails and discussing the design of a meeting place for the architectural meetings that were held in SL. From this resulting design collaboration, Brouchoud adopted the term, Wikitecture—the application of an open-source paradigm to the design and production of both real and virtual architecture and urban planning. Through their work, the Studio Wikitecture project and related group was born. “Since that time, our group has been conducting experiments to work out the exact procedures and protocols necessary to harness a group’s collective intelligence in designing architecture,” said Schultz. “In other words, in much the same way Wikipedia enables a loose, self-organizing network of contributors to collaborate on content creation, the Studio Wikitecture group has been using these experiments to work out the manner by which a group of geographical disperse individuals can come together to share ideas, edit the contributions of others, and to vote on the success or failure of proposed design iterations.” Collaborative Builds The group’s first project involved the design and virtual build of a meeting space, but was not a true representation of a collaborative effort in that the content created by an individual could not be edited or changed by another due to permission settings of objects. Describing the process of this first experiment, Schultz said each design submitted “was not a fully worked out design, but was instead like the early stages of any projects—a hand full of sketches and massing diagrams. In this sense, it was very much like how any type of project evolves in a typical AEC firm; from schematic sketches to more detailed drawing and models.” They also found that it was important for members to focus more on building community consensus with diagrammatic information rather than working individually on design details that would end up getting shot down by the rest of the community. At the end of the first trial, the group came away with an expected result: an interesting design with little overall coherency or unity The second experiment involved creating a build in which all group members would allow their objects to be changed or edited by others. A Flickr site was also set up by the group to allow those working on the project to upload photos of their designs with related information. The group used a type of archiving system in which all iterations were stored to allow for a return to a previous build upon the decision of group members. The resulting 3-D build illustrated a more unified and coherent design than that shown in the first experiment. The Competition With two experiments under their belt and a group of individuals dedicated to moving forward, Studio Wikitecture bumped their experiments up a notch and moved into round three. In an effort to provide a more sophisticated collaborative tool, the group teamed up with i3D, a Second Life-based company. 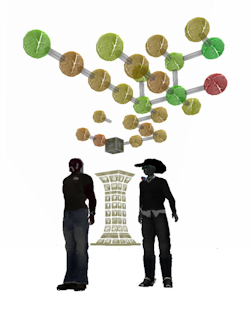 i3D developed an in-world interface—the wiki-tree—to allow for building and archiving of Second Life models by group members. “The wiki-tree allows contributors either to submit their own design or modify the design of others, and like a 2-D wiki, all these evolving versions are saved in a archived history,” said Schultz. “Once a member saves their design iteration to the ‘tree,’ the submission, and any associated explanation that was included, becomes public for the rest of the contributing community to view. The group then votes on the submittal’s strength as a contribution. 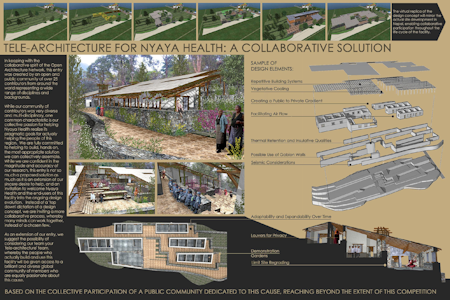 All votes are continually tabulated, and ultimately the most popular ideas advance as an integral part of the evolving design.” The group also decided to use this experiment as an emulation of the philosophy behind the Open Architecture Network (OAN), an online group with a mission of using open source architecture for humanitarian purposes. In pursuit of this effort, the group began their third project with the goal of developing a submittal for a competition hosted by OAN that was aimed at providing solutions for building sustainable, multi-purpose, low-cost technology facilities for those who need them most. 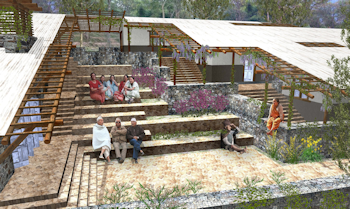 From a choice of sites in South American, Africa, and Asia, the Studio Wikitecture group chose to focus on the design of a medical facility in rural Nepal. To facilitate further collaboration among members, the team set up a Web site, forum, and online wiki to allow the posting of research information, uploading of images, voting by members, and posting of comments related to the designs. Shultz described the method by which contestants would have traditionally approached this type of contest. “The way competitions are traditionally run, and this was the case for the Open Architecture Network as well, is that after the host unveils the project, all the different entrants go to their separate corner and work out their individual designs in relative isolation. The problem, however, since only one entry can really win, a lot of the good ideas offered up in the other entries, are either not incorporated in the final design or they are incorporated, but without recognizing the original author. Either way, this is both unfair and inefficient.” In contrast, the Studio Wikitecture group was able to develop their entry in a more public and open fashion. “The goal was to create a unified entry for the competition that was created through the collaboration of many contributors. The benefit of this approach is that we were able to pool all of the great ideas each of us had, and create a 'super-entry,' if you will, that is the product of a large collaborative team.” The group held their kick-off meeting in the fall of 2007, set up a build site on land donated by KK Jewell of arcspace, and by the end of February 2008, the team had their design finalized and accepted by OAN. The final result: out of 263 qualified entries representing the work of 849 design team members from 57 nations, a jury awarded the Studio Wikitecture group’s design a Founder’s Award along with third place in the Asia Challenge portion of the competition. Wikitecture and design/build Jon Brouchoud, architect and co-founder of Studio Wikitecture, pointed out at one of his presentations this year that bringing more heads together sooner allows problems to be vetted earlier in the design process ultimately leading to cheaper and more efficient processes altogether. And technologies that aid in the adoption of this approach can help the building industry better cope with increasing economic challenges. “From the search for the cheapest bid to the shortage of licensed professionals, these market pressures will play a significant role in defining the value of an integrated and decentralized model,” said Schultz. The use of the Studio Wikitecture technology can aid in this process by allowing for contributions from semi-professionals to professionals in adjacent professions. “This might develop into alternative internship programs or alternative paths for individuals to become licensed as engineering, architectural, and other building professionals,” said Schultz. “Licensure could evolve into a gradient of licensing where instead of being such a black and white determination of whether you are qualified or not, a more realistic gradient of rankings could be established such as architect 1, 2, or 3 or engineer 1, 2, or 3.” Schultz added that this collaborative approach would also offer a more open platform for involving suppliers and vendors earlier on in the design process. “They become more of a partner in the process than an end-game supplier.” This method also allows clients and the public to become involved at a very early stage offering opportunities for them to contribute significantly to the project design even if they do not have a technical background. In this manner, all stakeholders are able to view and interact with a design before any money is spent on building materials or equipment. With tools like Studio Wikitecture, today’s public hearings may become tomorrow’s virtual walkthroughs.